Welcome back for another tutorial! 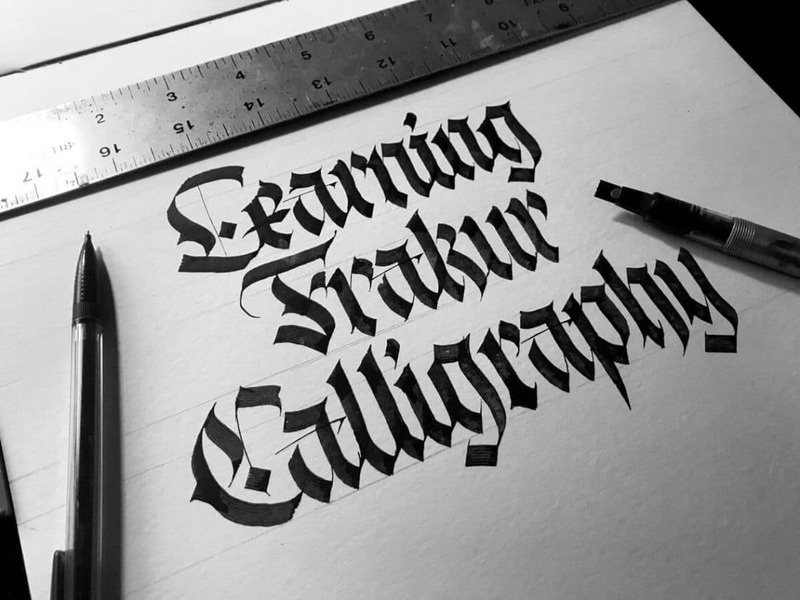 Jake will be guiding your throughout the rich history of the blackletter script, the tools you need and how you should practice by diving deep into the basic letter structure. By the end of this article you will have a clear understanding on what you need and how you can get started. Jake included some FREE downloadable (printable) practice sheets for both the lowercase and uppercase alphabet. My name is Jake Rainis and I’m a calligraphy artist from Boston, Massachusetts (USA). I’m extremely passionate about flat-pen calligraphy, particularly all of the different styles of Blackletter calligraphy. Today, I’d like to teach you everything you need to know to get started with one of the most prominent styles of Blackletter; Fraktur. Fraktur is one of the four core styles of blackletter. Before jumping in, I’d like to address one of the most commonly-asked questions about Fraktur (and subsequently, every other style of Blackletter calligraphy). What are the different styles of Blackletter calligraphy and how can they be distinguished from each other? If you’ve ever pondered this question, you’re in the right place! Blackletter calligraphy has a rich history, and while this history is beyond the scope of what can be packed into this article, it does help to have a high-level understanding of what Blackletter calligraphy is at its core. This understanding will help to make your journey more purposeful and help you learn to differentiate one style of Blackletter from another. Blackletter is a category of medieval-era calligraphy and typography. Any other variation can be considered an offshoot that developed from one or more of these core styles (common examples include Cursiva or Schwabacher). These styles developed between the 11th and 18th centuries in the order described below. Over many centuries, their generational evolution was the result of regionality, education (or lack thereof), available materials of the time, religion, and politics. Blackletter’s roots started with Textura, which came about in the 11th century as a response to Europe’s evolving literacy. As more universities opened their doors, so did the need for educational text books. Carolingian was the standard hand at this time. However, despite its clear legibility, it was time-consuming to produce and its wide letterforms occupied a considerable amount of space on the page. For these reasons, scribes in Northern Europe began developing alternative forms of Carolingian that became the Textura style we know today. The strokes in these letterforms were more uniform than Carolingian and carried a repetitive vertical rhythm. This allowed scribes to work faster and since the letterforms were much narrower, more text was able to fit on a single page. Textura is the foundational basis of all Blackletter calligraphy. Edgar Villa wrote a fantastic and comprehensive article about Textura. Be sure to check that out for further learning! Shortly after the emergence of Textura in the 11th and 12th centuries throughout Northern Europe, Rotunda emerged from Southern Europe. Rotunda shares some of the same structural characteristics as its rigid cousin Textura, but as the name “Rotunda” might suggest, it also features far more rounded qualities. As a result, the style is far less rhythmic and considerably more legible. You’ll also notice that some of the vertical stems in Rotunda’s letters feature flat bottoms. This quality is truly unique to Rotunda. Jumping back up to Northern Europe, the 14th century saw the emergence of Bastarda. Also true to its name, Bastarda scripts can be characterized as bastardized treatments of Textura. The style itself is defined as a hybrid mix of traditional Textura and the simplified Cursiva styles that came about in later centuries. This evolution from Textura script is likely due to the fact that in addition to the development of better materials during these times, Bastarda is quicker and easier to write. Because of this, Bastarda is considerably more gestural and organic, as opposed to rigid and uniform. While there are no singular “textbook” forms of any style of Blackletter, Bastarda is perhaps the most nebulous since its execution is far less prescribed than its predecessors Textura and Rotunda. Fraktur, which didn’t make its debut until the 16th century is the fourth and final core style of Blackletter. In an effort to incite a centralized typographic normality, it was developed under the orders of a German emperor who was frustrated with the difficult-to-read hands throughout Europe. There are centuries of controversy-filled history behind Fraktur’s existence, but it finally fell out of popularity in the mid 1900s. This was due largely in part to the rise of the Third Reich. Most Nazi propaganda was printed in Fraktur throughout World War II and the style eventually (and unfortunately) became synonymous with the Nazi Regime. Of the four core Blackletter styles, Fraktur is the arguably the most prominent and mature. It’s heyday was far longer than its predecessors and it existed during a time in which it could be printed and widely distributed. The word Fraktur is derived from the Latin word “fractus”, which means broken. This word translates to English as “fracture”. This could certainly be said about other styles of Blackletter, but the stroke formations of Fraktur – particularly its uppercase letters – are considerably more complex and broken apart. The angles and curves of Fraktur letterforms differ greatly from the Textura hand which is comprised of shorter, straighter strokes that fall at just several different angles. Earlier Blackletter hands were straight, rigid, and narrow, which created a strong vertical rhythm and because the letters were often tracked together tightly to conserve space on a page, they were difficult to read. Fraktur does contain rounded strokes, but Rotunda is perhaps the easiest style to distinguish it from since Rotunda letterforms are not “fractured” much at all. They also contain flattened vertical stems as previously mentioned, which is not an aesthetic feature present in Fraktur. Bastarda is perhaps the most difficult style to differentiate from Fraktur since their letter structures share some similar qualities. Overall, Bastarda tends to be wider, simpler, and more gestural, so use these three visual features as clues when identifying differences. As you might already know, there are an overwhelming number of tools out there designed to create calligraphy. However, when it comes to Blackletter, or any other style of flat-pen calligraphy, traditional pointed nibs and brush pens that are used to create Copperplate or Spencerian scripts aren’t the best-suited utensils for the job. Instead, you’ll want to use a broader tip. Broad tips can come in the form of markers, fountain pens, brushes, and quills. All are worth exploring in depth throughout your creative pursuits because each will yield different results based on the application. Likewise, each one will require its own unique learning curve. If you’re just getting started, I’d encourage you to prioritize learning the calligraphy itself, rather than focusing too much effort on learning how to wield the tools effectively. This will streamline your initial learning. And once you’ve grown comfortable with the calligraphy, you can branch out on tools to your heart’s content. The lowest barrier to entry is undoubtedly the Pilot Parallel fountain pen. Parallels are an absolute must-have if you’re serious about Blackletter or flat-pen calligraphy. The broad-edge tip is comprised of two parallel slabs of metal that feed the ink. (get both the 3.8mm and 6mm – you won’t regret it). These pens are extremely precise, robust, and easy to maintain. You can also refill the cartridges with your own ink as well as mix other colors to create beautiful gradations. I have no explicit recommendations for brand or materials here. I use what I have lying around. If you’re looking for more specific recommendations, Edgar Villa goes into sufficient depth about the tools he uses in his article about Textura. When it comes to preparing your composition, chances are you’ll want to use guidelines as a visual aid. A typographic line structure is comprised of several horizontal lines marking the different spacial anatomies of a letterform. You’ll want to draw these guidelines out so that you can ensure consistency throughout your work. All letters sit on the baseline, and most lowercase letters are as tall as the x-height. However, some letters (such a “b” or “l”) have a stem that rises beyond the x-height. These extended portions of a letter are called ascenders, and they’ll reach all the way up to the ascender guideline. Likewise, some letters (such as “j” or “p”) have descenders, or portions of the letter that reach below the baseline all the way down to the descender guideline. All uppercase letters also sit on the baseline and a couple also have descenders. However, unlike their lowercase counterparts, they’re all as tall as the ascender guideline. How far apart these guidelines are from each other is another important aspect of how your letters will appear aesthetically. Traditionally, vertical spacing in Blackletter calligraphy is measured in units, where one unit represents one nib-width of your pen. For example, if your nib is 6MM wide, then your spacing unit is 6MM. Most fraktur alphabets follow “2:4:2 ratio”. I would recommend you begin your studies with the classic 2:4:2 ratio. Once you’re comfortable with this approach, experimenting with guideline spacing is something you can and should do in your calligraphy explorations. Over the many centuries of Blackletter’s heyday, scribes began to write with more expression and gesture. This was likely due to speed as well as the evolving quality of paper, since their pens could glide without catching their nibs on rough edges and paper fibers. This expression is visually apparent when comparing early 12th century Textura samples to 17th century Fraktur samples. This expression, paired with its complex structure is what makes Fraktur so nuanced, and arguably the most difficult to learn. But of course, that doesn’t mean it cannot be done! When approaching Fraktur, there’s a couple of aspects you’ll want to keep in mind. First, and perhaps most important; the angles most Fraktur letterforms are comprised of vary drastically when compared to Textura, in which the pen sits at just a couple of rather steady angles. The horizontal strokes that connect vertical stems in Fraktur are noticeably more sporadic and varied than the rhythmic consistency found in Textura. As you learn to write Fraktur, you’ll want to get comfortable with rotating the pen from stroke to stroke to achieve appropriate angles and varied widths. While the Fraktur alphabet might follow less of a typographic system than Textura, you’ll begin to identify similarities between certain letters that will help you commit these stroke techniques to memory. Another major characteristic of Fraktur (and one beginners often find confusing) is the construction of its vertical stems. At first glance, a newcomer might wonder how such points can be achieved in one stroke. Instead, they’re done in several layered strokes. These stems appear in the majority of the lowercase letters and are a major visual factor athat distinguishes Fraktur from other styles of Blackletter calligraphy. Practicing this layered stroke over and over again is a great way to build a solid foundation for many different letters in the alphabet. If you’ve read this far, you should now be well-equipped to begin practicing the Fraktur alphabets. And practicing (for hours and hours on end!) is really all it takes to become proficient in any style of calligraphy. To aid you in your studies, I’ve put together a printable guide for the lowercase and uppercase alphabets. The guides are sized for pens with a 3.8MM nib-width (the exact size of the green Pilot Parallel for convenience) but any pen in the 3.5-4.5MM range will suffice for practice. Print out as many copies as you need and begin by tracing each letterform. As you trace, pay close attention to the angles at which each stroke starts. Also make note of their size and how they sit in relation to each other as well as the negative space around them. Understanding these relationships will help reinforce the uniformity necessary to create consistent letters and words. Once you’re comfortable enough with tracing, try recreating them from visual reference without tracing them. And after enough practice, you’ll become intimate enough with these letterform structures to recreate them from memory without a visual reference. This is where the fun begins! Memorizing an alphabet is only the beginning of your journey. At this point, you can begin experimenting with different materials, creating complex compositions, working at different scales and guideline ratios, and even begin evolving the alphabet into your own signature style! Hopefully this article was comprehensive enough to give you a robust background in what Fraktur calligraphy is in relation to other styles of Blackletter as well as how to distinguish it and recreate it for yourself. Obviously, it’s impossible to provide enough information within a single post for one to master a style of a calligraphy. However, if you’re interested in taking your learning to the next level, I’ve created a series of books to help you do so. Each of these four books covers one of the four styles of Blackletter calligraphy in extensive detail (Textura, Rotunda, Bastarda, and Fraktur). Mastering a style of calligraphy can be difficult and frustrating, but don’t let this discourage you. It will probably not come about naturally for you, but you’re not alone. Keep in mind that even though it can be considered an art-form by today’s standards, it originated as a utilitarian practice. No one was born possessing an innate skill to write calligraphy. It only came about with deliberate practice, just like learning to speak a language. Take breaks often, particularly if your hand gets sore or if you find your focus and attention drifting away from your work. Learning a style of calligraphy is like working out. Going to the gym once for four hours is far less effective than going regularly in shorter intervals. Dedicate time to practice regularly, and you’ll be impressed by your own work in no time! Be sure to join our official Facebook group where you can share your work, ask questions about lettering & calligraphy, network with fellow artists and much much more! I'm Jake Rainis, a Calligraphy Artist from Boston. My journey as an artist started when I was old enough to hold a pencil, but it wasn't until high school that I committed to becoming a creative professional. When I graduated, I moved to Boston and earned my degree in Graphic Design at Northeastern University. I've been living in Boston ever since and have over decade of experience serving clients in a variety of fields. I began specializing in typographic arts in 2013. Over the course of several years practicing lettering and calligraphy for myself and for my clients, I have found my niche in pushing the boundaries of blackletter calligraphy. Calligraphy is a discipline that dates back centuries. While many may think it to be an obsolete utilitarian practice, it is actually an evolving subculture celebrated by artists around the world. Through my own work and teaching, my goal is to spread awareness of this culture and help aspiring artists find success in their creative endeavors. Awesome job guys and thanks particularly to the author. It is quite inspirational and clear instructed. I also dropped my email but didn’t receive anything. Could you send the practice sheets, please? Cheers! Hey Criserna, im happy to hear that you enjoyed the article! Im sorry you didn’t receive the practice sheets. So good that I ended up buying two of the books, absolutely worth it! Very nice! I’ve been a long time practitioner of textura and I’ve always wanted to try other styles. I put my email down at the end but I never received the free practice sheets? Hey Lisa! Thank you so much for the kind words. Im really sorry to hear you are having problems claiming the practice sheets. Happy to hear you liked it! Cheers!